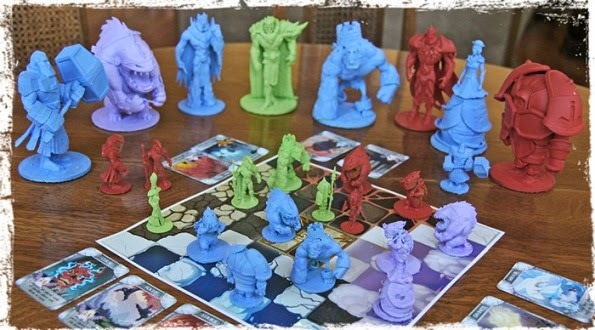 Kings Down is a chess inspired board game currently running on Kickstarter. It has been developed by Saar Shai, a man you might recognise as being the developer of The Agents. The game is loosely based on chess, using traditional chess pieces, all of which move in ways you’ll be familiar with and the game is played on a traditional 8 by 8 grid. After that the similarities end. The first difference between chess and King Down is that the game can be played with 4 players, however, the preview version I had could only accommodate two. The second difference is that this game is now a victory point driven game. Points are awarded for taking enemy pieces and holding the 4 squares in the centre of the board. These points are doubled if a king is concerned and the first player to eight victory points is the winner. What this means is you’re not going to win by simply sitting back and acting all defensive, King Down is all about playing with aggression and taking out the enemy pieces. The last main difference is that pieces don’t automatically start on the board; instead they can be brought in by spending action points or by playing cards from your hand. Those cards can also be used to give your pieces extra actions or special abilities. In addition there are a host of spells that seriously mix matters up. What this amounts to is a quick strategic game where the cards in your hand are just as important as your location on the board. Some of those cards allow some cool and downright deadly moves, such as teleporting across the board and executing a double take down. You can imagine how these change a game of chess into something completely different. As seems to be the standard with the recent batch of Kickstarter prototypes, the rule book is bloody awful and although I know this problem is not limited to just Kickstarter games, it is a common problem. It should also be said that I played this using my own chess set (which happened to be a Star Wars one) which means I cannot comment on the quality of the final miniatures and components. However, the design of the sculpts are pretty cool and each colour has its own distinctive style. King Down is a good way of learning, and thinking about, chess strategy without worrying about 32 pieces and trying to think three moves into the future. The card system takes some of the stress out of chess as it means you can’t plan too far ahead. Whereas chess is a game of strategy, King Down is a game of tactics. The trade off is that quite a lot of randomness gets added to the game and a good draw of the cards can give you a great advantage. That being said King Down is a very quick game and after 15 to 20 minutes you can just reshuffle and start again. King Down is not the most original game, playing like a magpie’s nest of chess and Hero Academy, but it plays well. It does introduce variety, randomness and some colour to chess. It isn’t for chess fans looking for a change, no King Down is for people who like the idea of chess but find that actual game dull, long and rather grey. King Down is on Kickstarter now and is well on its way into some stretch goals.